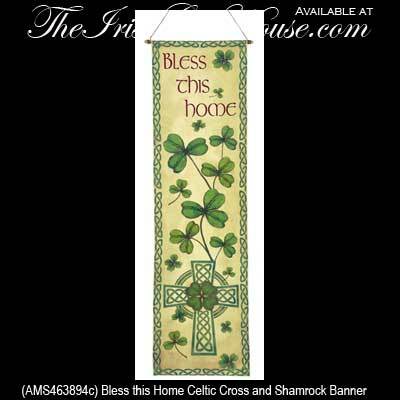 This Irish home blessing banner features a Celtic cross and is enhanced with Celtic knots and shamrocks. Bless this home is the verse on this Irish wall hanging. This colorful Irish home blessing wall hanging from The Irish Gift House features a Celtic cross, but it also has a Celtic knot border and shamrocks too. This Irish wall banner is made of fabric and it measures 11” wide x 37 1/2” tall. The Irish home blessing banner is ready to hang in your home with the included rod and cord and it is received with a shamrock and a Celtic knot history card.